It’s winter, and if you keep your feeders stocked and make sure you have a heated open water source for birds to drink and bathe,what else can you do to attract different birds? Winter finches are a good choice as they are both beautiful and extremely hardy. But they are also picky about what they will eat and are irregularly found in different areas as they follow food south from their Canadian boreal homes. This year some species of finches are already moving into the US to overwinter in large numbers as their food sources will not be good enough where they are. If you cater to their needs, and you are in an area where these birds stay over the winter, this year you may have a backyard full of chattery, beautiful finches and nuthatches like Common Redpolls, Purple Finches (already as far south as Georgia and in California), Pine Siskin even Red-breasted Nuthatches (both species already throughout the Eastern US, Great Lakes area and the far West) by doing a few simple things. The first and most important is to offer food they want. The primary seed you need to get is nyger – it’s a small thin black oily seed that is packed with energy and nutrition and finches love to find this especially in winter and also when they are feeding their chicks in the summer. They also love millet and black oil sunflower seeds. If you offer also chopped peanuts, you will attract more nuthatches as well. 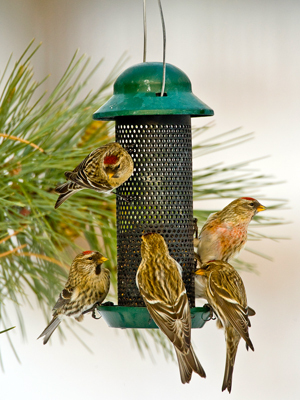 Nyger requires a tube or mesh feeder which is a good investment as you can use it year round for finches. While finches are hardy, they still need protection from extreme cold and you can help by offering pine trees in your yard. Native pines are ideal and if you haven’t planted them yet, make a note to add them to your landscaping in the spring as many birds find both food and shelter in their branches. If you don’t have any pines on your property, here is a perfect use for your Christmas tree after its stint in your house. Any bird would find a used Christmas tree, free of all trim, to be a great spot to hide from predators and gain shelter from the cold. The expectation this year is that there will be a number of species of finches coming south into the US looking for food. Get your backyard ready for these beautiful visitors and enjoy the show!